Fig. 1. 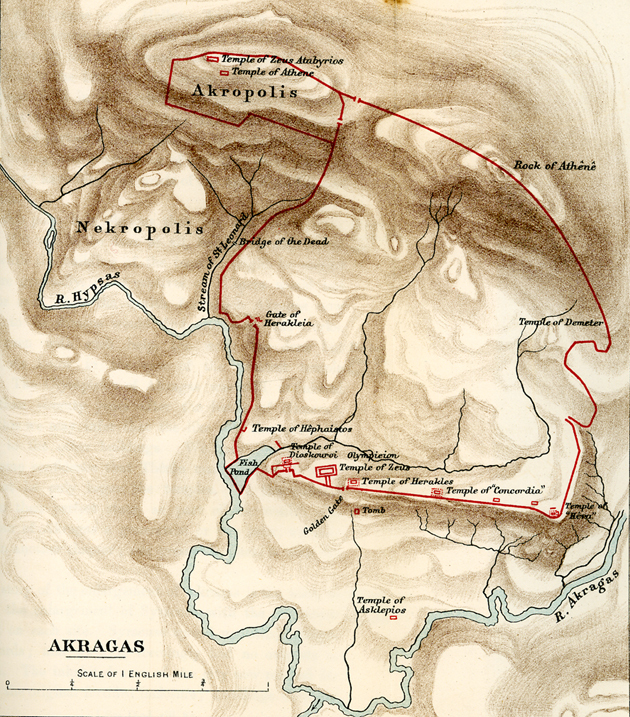 Map of Akragas (Freeman 1891, 244). Fig. 2. 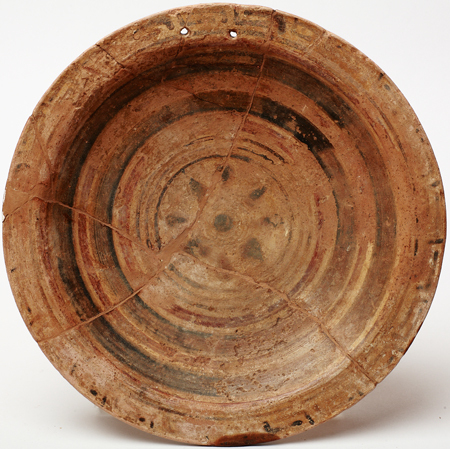 North Ionian Late Wild Goat Style plate from the Montelusa necropolis. Agrigento, Museo Archeologico Regionale, inv. no. S/2254 (© Regione Siciliana, Assessorato Regionale dei Beni Culturali e dell'Identità Siciliana; courtesy Museo Archeologico Regionale "P. Griffo") (= fig. 2 [left] in published article). Fig. 3. 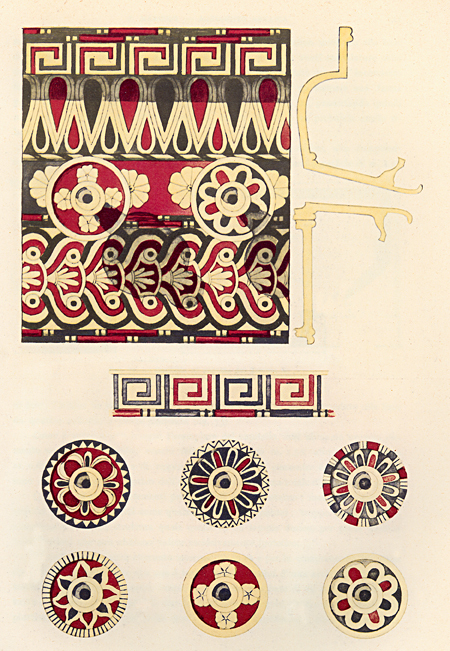 North Ionian Late Wild Goat Style plate from the Montelusa necropolis. Agrigento, Museo Archeologico Regionale, inv. no. S/2258 (© Regione Siciliana, Assessorato Regionale dei Beni Culturali e dell’Identità Siciliana; courtesy Museo Archeologico Regionale “P. Griffo”) (= fig. 2 [right] in published article). Fig. 4. 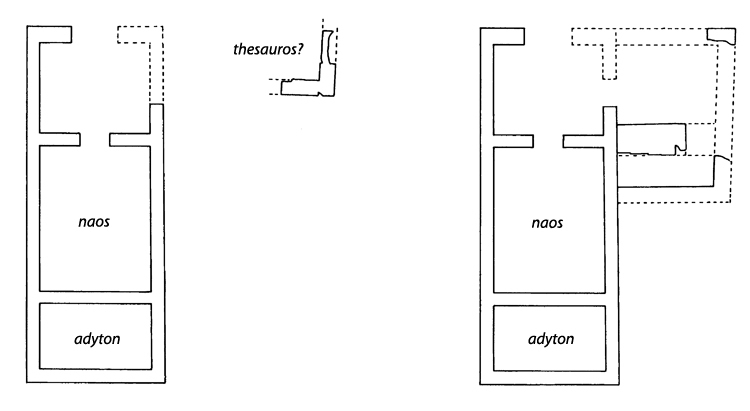 Plan of the Hellenistic-Roman urban grid (at left are the sacred area of San Nicola, the ekklesiasterion, and the bouleuterion) (adapted from De Miro 1994, fig. 3). Fig. 5. Drawing of the archaic "casette a schiera" (Marconi 1929a, fig. 17). Fig. 6. 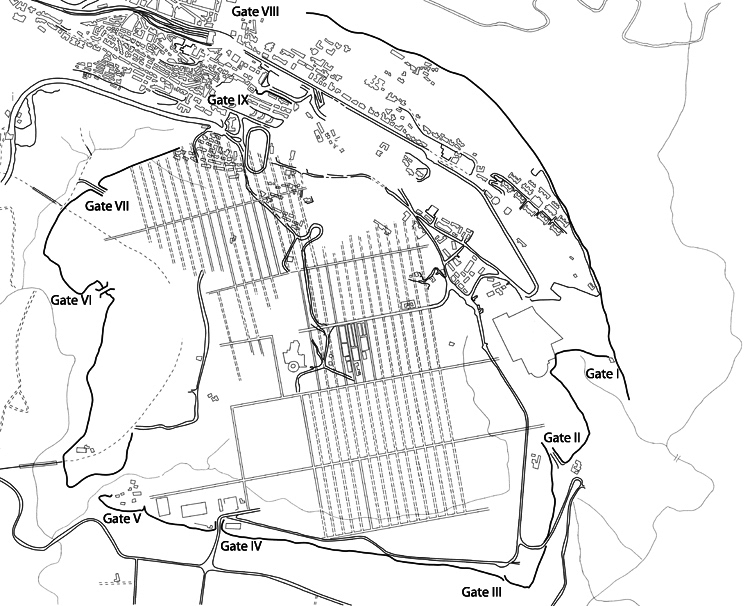 Plan of the fortification wall and gates at Akragas (modified from Bennett and Paul 2002, fig. 11). Fig. 7. 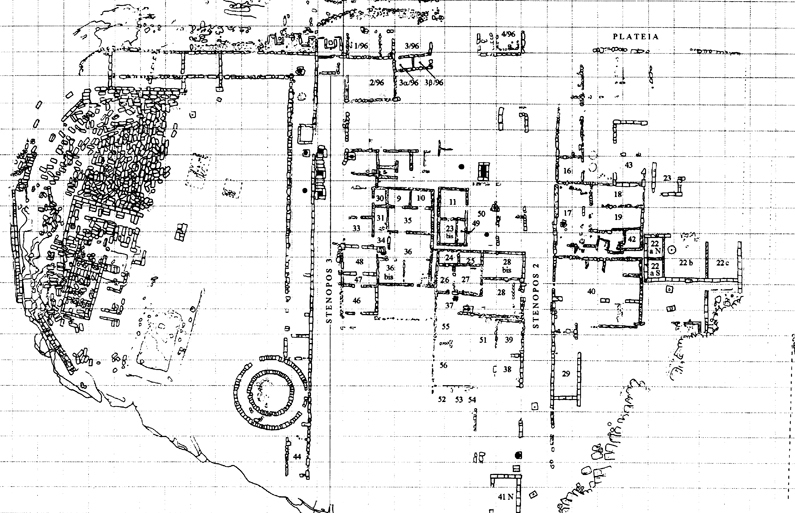 Plan of the Sanctuary of the Chthonic Divinities (Marconi 1933, fig. 5). Fig. 8. 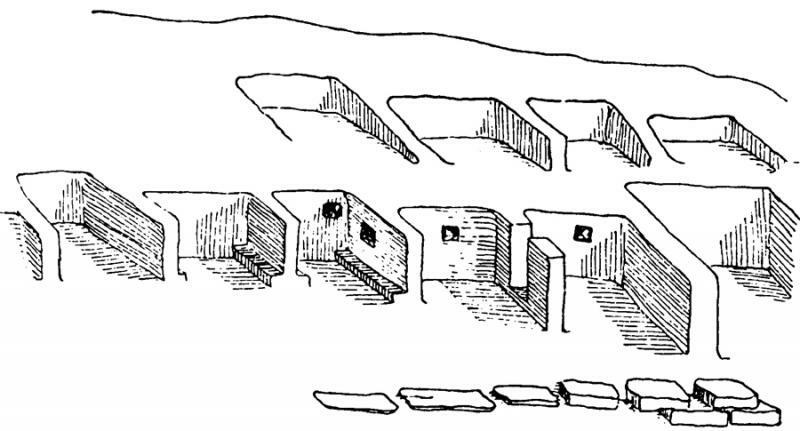 Reconstruction of the Sanctuary of the Chthonic Divinities (Marconi 1933, pl. 20). Fig. 9. 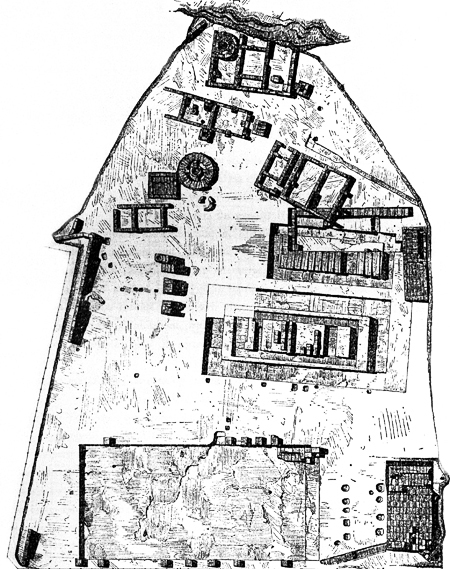 Plan of Temenos 1, Sanctuary of the Chthonic Divinities. The temenos had a first phase with an open-air altar that was later incorporated into the enclosure. On the eastern sides of both Temene 1 and 2, a room was added, probably at the beginning of the fourth century B.C.E. (Marconi 1933, fig. 6). Fig. 10. 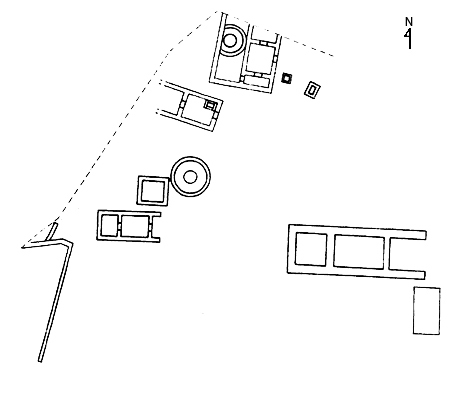 Plan showing the bipartite architectonic structure of Temenos 2, Sanctuary of the Chthonic Divinities. On the eastern sides of both Temene 1 and 2, a room was added, probably at the beginning of the fourth century B.C.E. (Marconi 1933, fig. 7). Fig. 11. 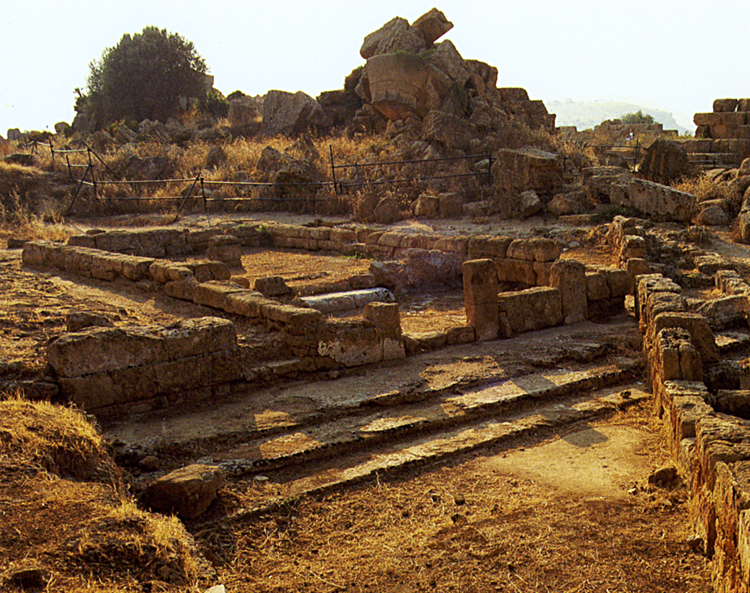 Building development at the Sanctuary of the Chthonic Divinities during the middle of the sixth century B.C.E. (Zoppi 2001, fig. 114). Fig. 12. Building development at the Sanctuary of the Chthonic Divinities during the end of the sixth century B.C.E. (Zoppi 2001, fig. 115). Fig. 13. 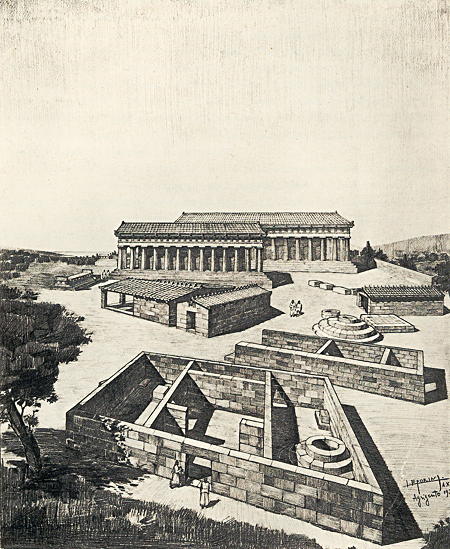 Building development at the Sanctuary of the Chthonic Divinities during the fourth century B.C.E. (Zoppi 2001, fig. 116). Fig. 14. 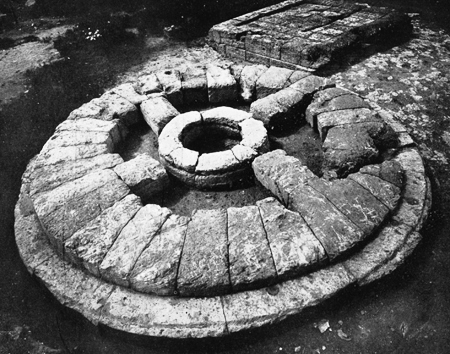 Circular altar at the Sanctuary of the Chthonic Divinities (Marconi 1929b, fig. 14). Fig. 15. 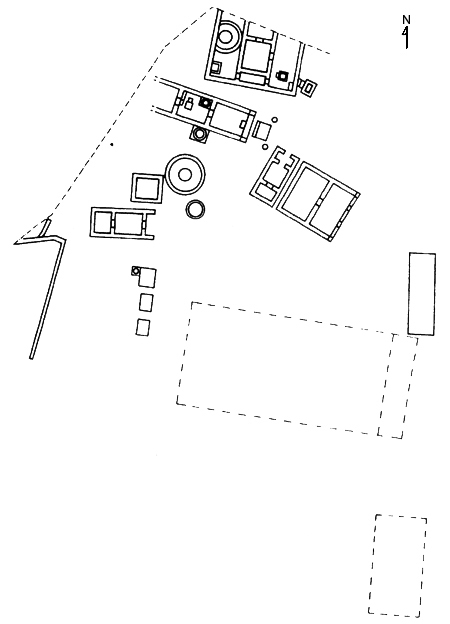 Plan of the sacred areas at Gate V, showing the Sanctuary of the Chthonic Divinities (left) and a small temple alongside the walls (right). 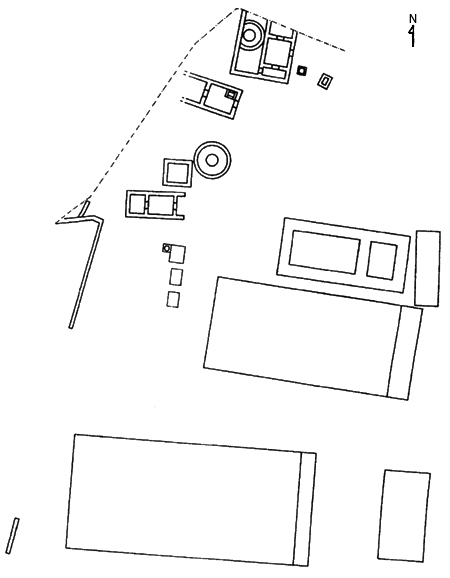 The area was defined on the northern side by a rectangular structure, probably a lesche (modified from De Miro 2000, fig. 1). Fig. 16. 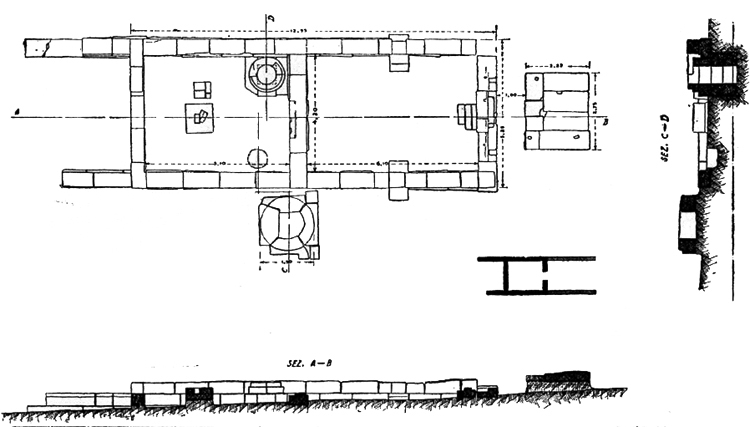 Plans and development of the small temple at Gate V during the middle and the end of the sixth century B.C.E. (modified from De Miro 2000, fig. 14). Fig. 17. The small temple at the southeast corner of Temple B. Photograph shows the archaic temple restored during the second half of the fourth century B.C.E. (modified from De Miro 1994, fig. 7). Fig. 18. 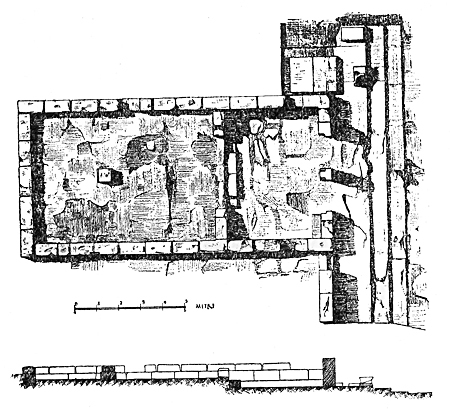 Plan of the small temple at the southeast corner of Temple B (Marconi 1933, fig. 79). Fig. 19. 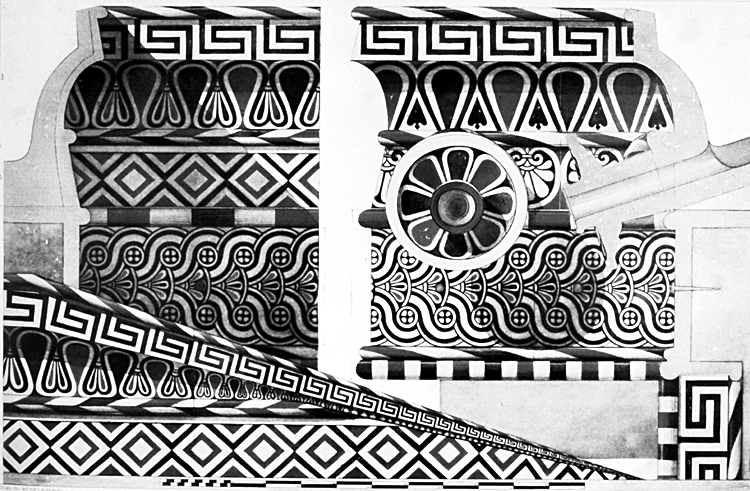 Architectural terracottas from the archaic small temple later incorporated into Temple G (Marconi 1933, pl. 120) (= fig. 6 in published article). Fig. 20. 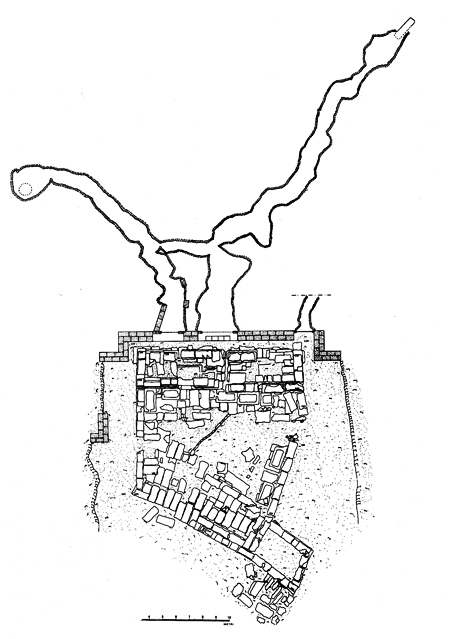 Plan of the elongated temple at Sant'Anna (adapted from De Miro 1980, fig. 8). Fig. 21. 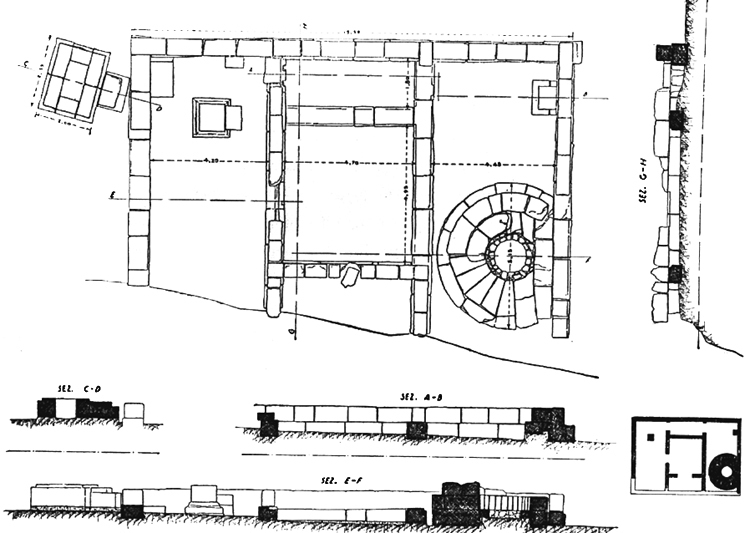 Section and plan of the early fifth-century monumentalized fountain in the sacred area at San Biagio (Marconi 1929b, fig. 2). Fig. 23. 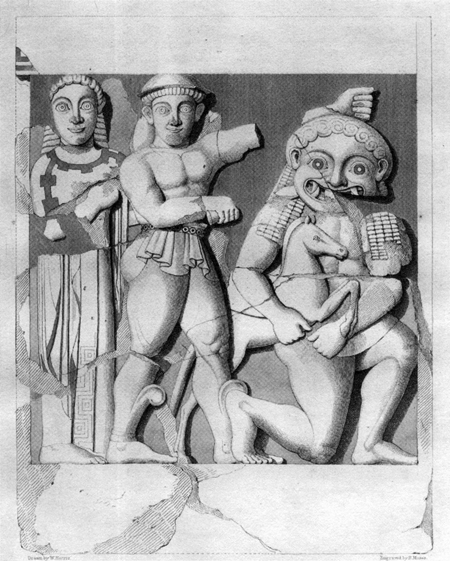 Architectural terracottas from the thesauros of the Geloi at Olympia (Mertens 2005, 49). Fig. 24. 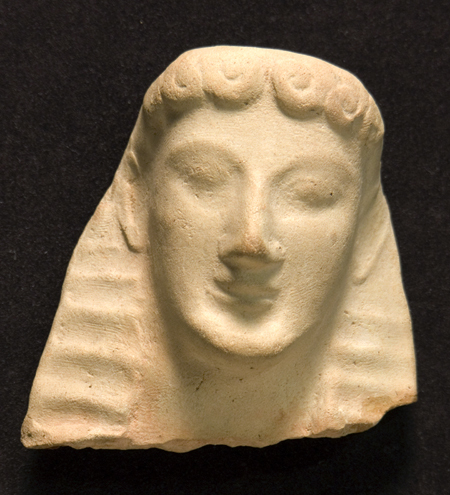 Sphinx terracotta head (middle of the sixth century B.C.E.). 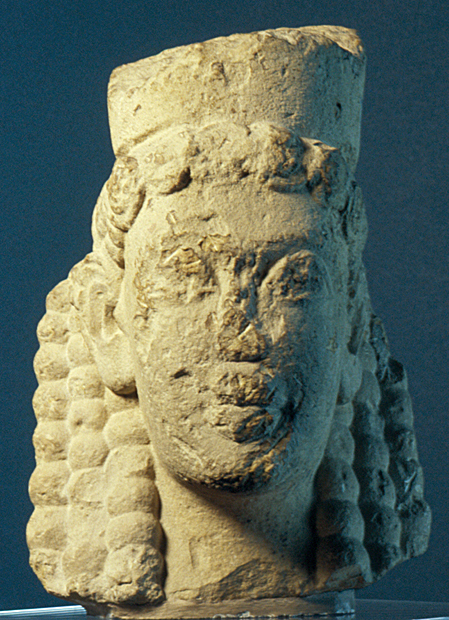 Agrigento, Museo Archeologico Regionale, inv. no. AG 1316 (De Miro 1994, fig. 27) (= fig. 8 in published article). Fig. 25. 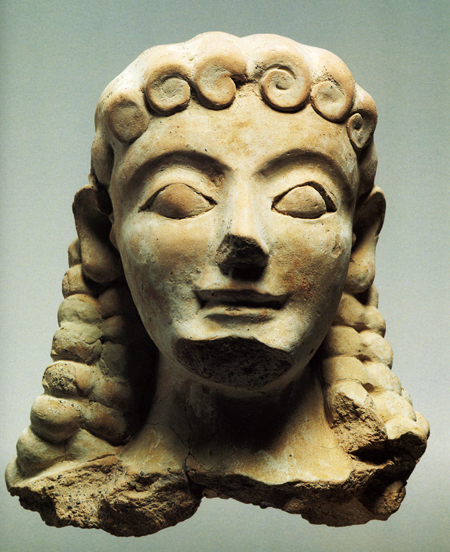 Female terracotta head from Gela (second quarter of the sixth century B.C.E.). Syracuse, Museo Archeologico Regionale, inv. no. 21429 (© Assessorato Beni Culturali e dell'Identità Siciliana della Regione Siciliana; courtesy Museo Archeologico Regionale "P. Orsi") (= fig. 9 in published article). Fig. 26. "Laganello" head. Syracuse, Museo Archeologico Regionale, inv. no. 754 (© Assessorato Beni Culturali e dell'Identità Siciliana della Regione Siciliana; courtesy Museo Archeologico Regionale "P. Orsi"). Fig. 27. 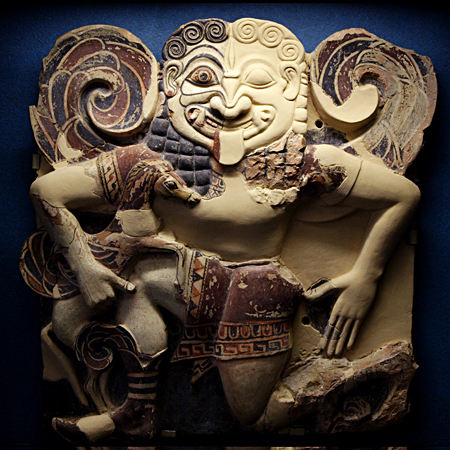 Terracotta relief with Medusa and Pegasus (580–570 B.C.E.). Syracuse, Museo Archeologico Regionale, inv. nos. 34540, 34543, 34895 (© Assessorato Beni Culturali e dell'Identità Siciliana della Regione Siciliana; courtesy Museo Archeologico Regionale "P. Orsi"). Fig. 28. 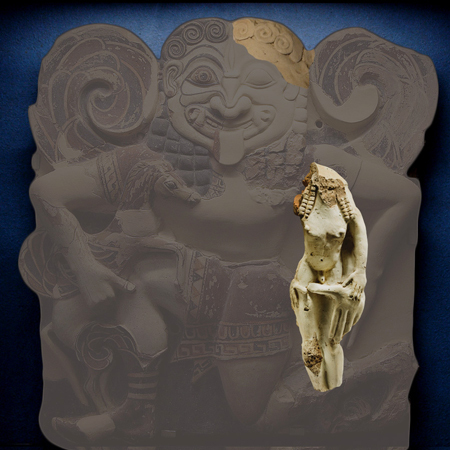 Rear view of terracotta fragment of a mythological group with Chrysaor (male body) and Medusa (left hand), probably a pedimental decoration. Copenhagen, Nationalmuseet, inv. no. 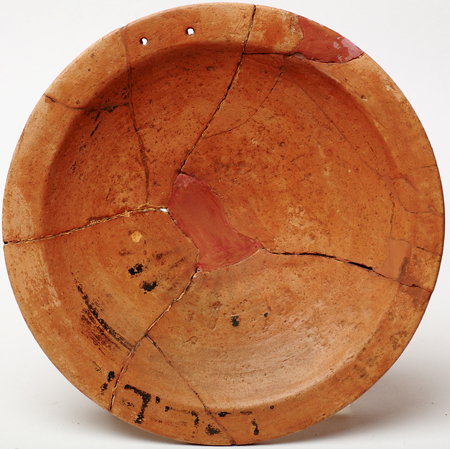 11372 (© Nationalmuseet, Department of Classical and Near Eastern Antiquities). Fig. 29. Reconstruction of the two terracotta fragments, now in Copenhagen. Fig. 30. Metope from Temple C at Selinous, depicting Athena, Perseus, Medusa, and Pegasus (Angell and Evans 1826, pl. 7). Fig. 31. Terracotta altar, depicting Medusa, Chrysaor, and Pegasus (mid sixth century B.C.E.). Gela, Museo Archeologico Regionale, inv. no. Sop. BL 10 (Bennett and Paul 2002, 248). Fig. 32. 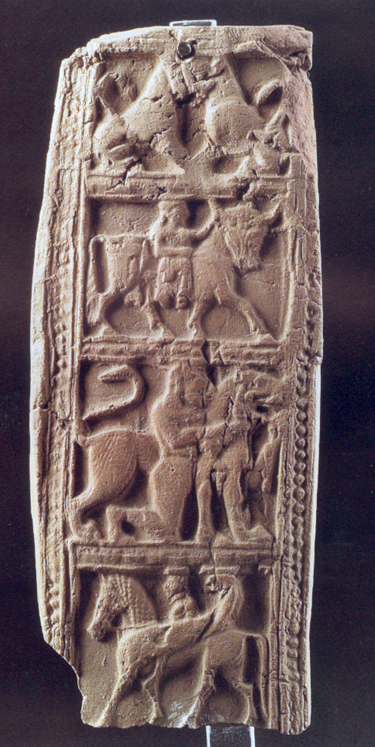 Terracotta plaque with mythological scenes. Agrigento, Museo Archeologico Regionale, inv. no. AG 1269 (De Miro 2000, pl. 47). Fig. 33. 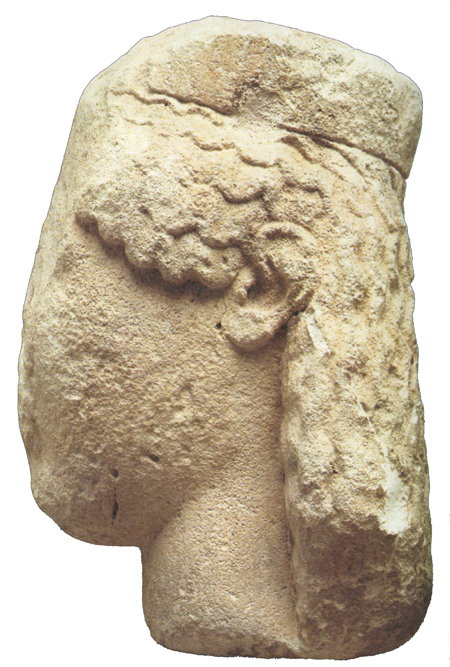 Kouros head in local stone. Agrigento, Museo Archeologico Regionale, inv. no. C 1837 (Pugliese Carratelli 1985, fig. 163) (= fig. 14 in published article). Fig. 34. 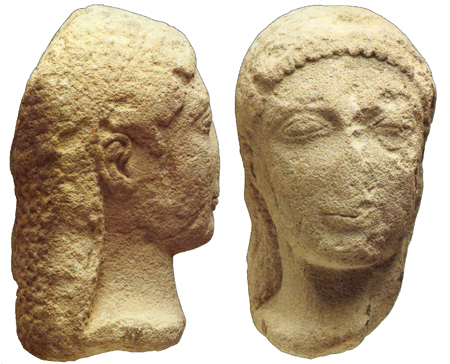 Female head, probably the cult statue of Hera from Temple E1 at Selinous. Palermo, Museo Archeologico Regionale, inv. no. 3889 (Pugliese Carratelli 1985, fig. 165) (= fig. 15 in published article). Fig. 35. 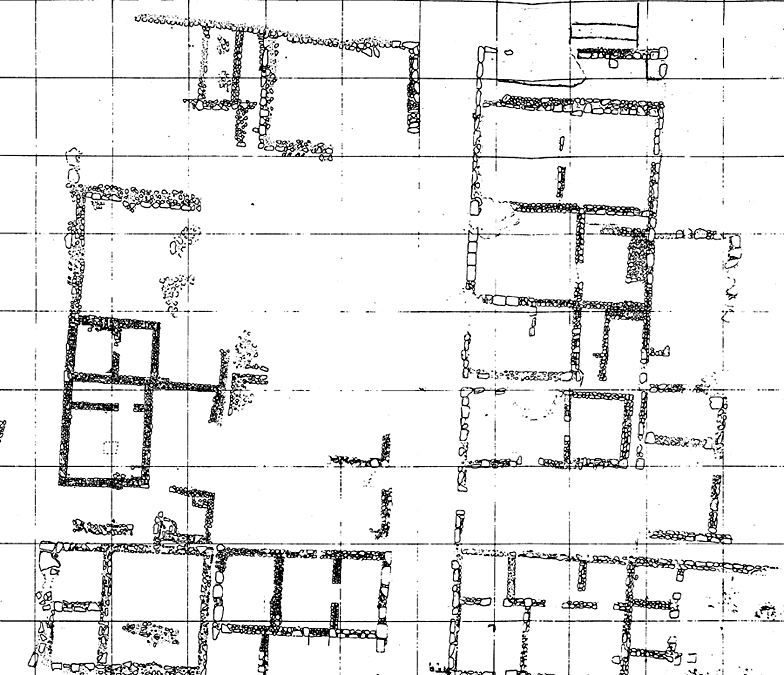 Urban plan from Temple Hill at Akragas around the last quarter of the sixth century B.C.E. (after De Miro 2000, fig. 8). Fig. 36. 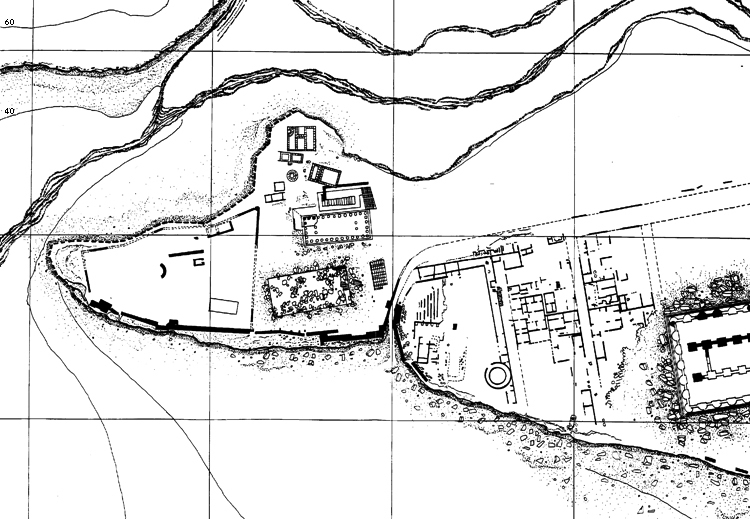 Urban plan at Monte Saraceno di Ravanusa, which was influenced by the Akragantine tradition around the end of the sixth century B.C.E. (adapted from Fisher-Hansen 2002, fig. 9). Fig. 37. Didrachm of Akragantine type from Himera, with a rooster on the obverse and a crab on the reverse. After 483/2 B.C.E. 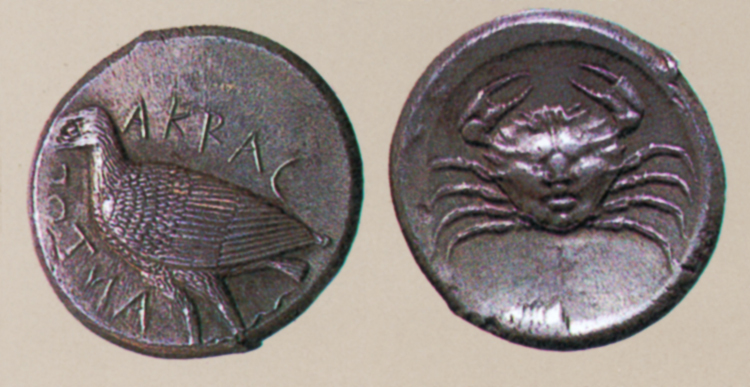 and the Emmenid establishment of power at Himera, the coins of Himera adopted the Akragantine crab type on the reverse (after Pugliese Carratelli 1985, fig. 58). Fig. 38. Tetradrachm of Akragas, with an eagle on the obverse and a crab on the reverse (Pugliese Carratelli 1985, fig. 68). Fig. 39. 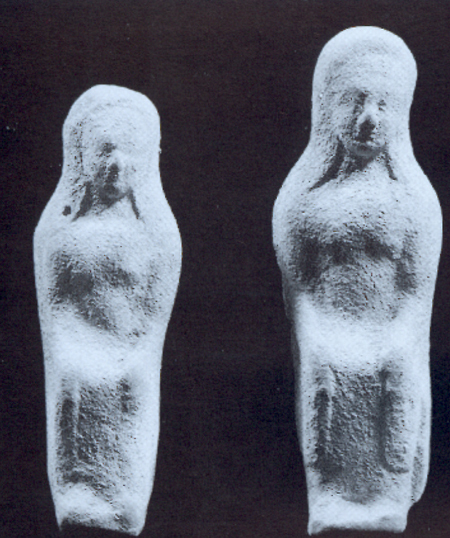 Terracotta statuettes from the sacred area at Gate V, influenced by Ionian style, 540–530 B.C.E. (De Miro 2000, pl. 57.1). Angell, S., and T. Evans. 1826. Sculptured Metopes Discovered Amongst the Ruins of the Temples of the Ancient City of Selinus in Sicily, by William Harris and Samuel Angell, in the Year 1823. London: Priestley & Weale. Bennett, M., and A.J. Paul, eds. 2002. 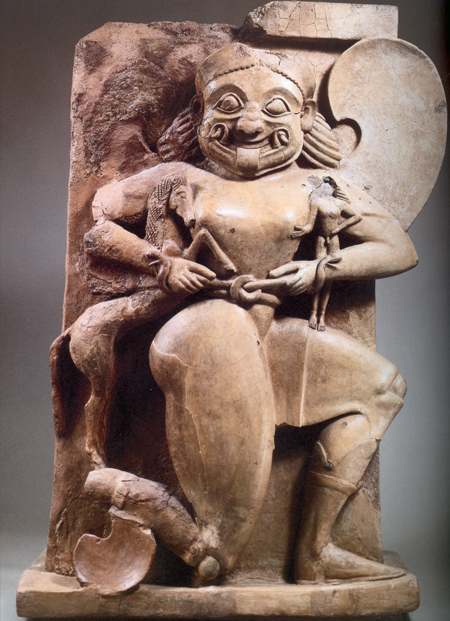 Magna Graecia: Greek Art from South Italy and Sicily. Cleveland, Ohio: Cleveland Museum of Art. De Miro, E. 1980. 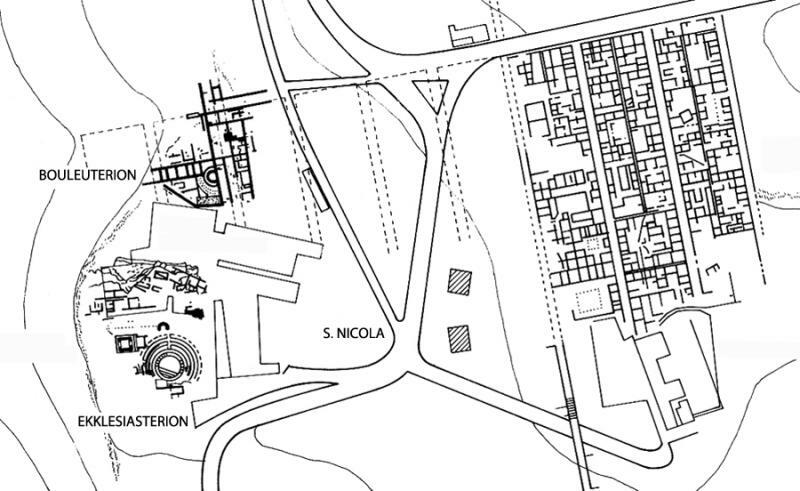 “Urbanistica e architettura arcaica in Agrigento.” In Architettura e urbanistica nella Sicilia greca arcaica: Atti della 3a riunione scientifica della Scuola di perfezionamento in archeologia classica dell’Università di Catania. Siracusa, 11–14 dicembre 1980, 91–100. CronCatania 19. Catania: Università di Catania, Istituto di Archeologia. De Miro, E. 1994. La Valle dei Templi. Palermo: Sellerio Editore. De Miro, E. 2000. Agrigento. Vol. 1, I santuari urbani: L’area sacra tra il Tempio di Zeus e Porta V. Rome: L’Erma di Bretschneider. Fisher-Hansen, T. 2002. “Reflections on Native Settlements in the Dominions of Gela and Akragas—As Seen from the Perspective of the Copenhagen Polis Centre.” In Even More Studies in the Ancient Greek Polis, edited by T. Heine Nielsen, 126–86. Papers from the Copenhagen Polis Centre 6, Historia Einzelschriften 162. Stuttgart: Franz Steiner. Marconi, P. 1929a. Agrigento: Topografia e arte. Florence: Vallechi. Marconi, P. 1929b. “Studi agrigentini: Il santuario arcaico delle divinità ctonie.” RivIstArch 1:31–52. Marconi, P. 1933. Agrigento arcaica: Il santuario delle divinità ctonie e il tempio detto di Vulcano. Rome: Libreria dello Stato. Mertens, D. 2005. “Architettura templare e civile in Sicilia dalle origini alla fine del V sec. 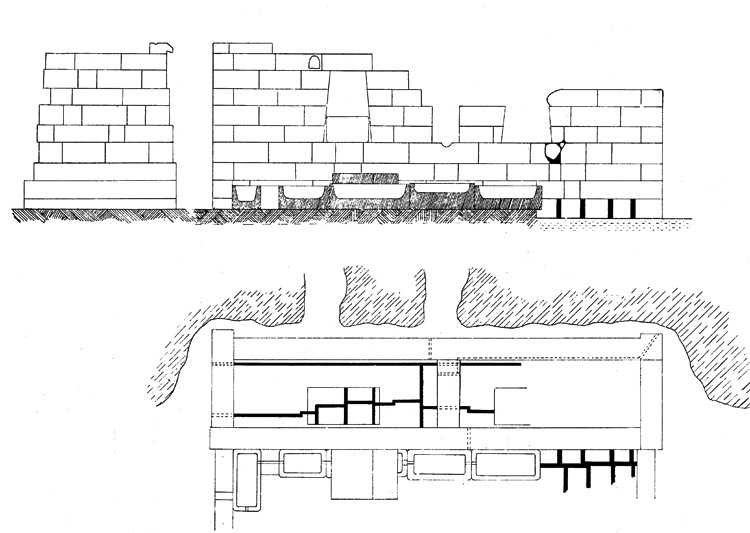 a.C.” In Urbanistica e architettura nella Sicilia greca, edited by P. Minà, 47–56. Palermo: Regione Siciliana. Pugliese Carratelli, G., ed. 1985. Sikanie: Storia e civiltà della Sicilia greca. Milan: Istituto Veneto di arti grafiche. Zoppi, C. 2001. Gli edifici arcaici del santuario delle divinità ctonie di Agrigento: Problemi di cronologia e di architettura. Alessandria: Edizioni dell’Orso.